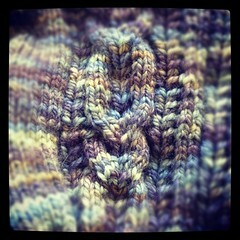 Thanks to everyone who left me a comment at my little stop during the Cast On, Bind Off blog tour! And thank you very much to Storey Publishing for putting it all together, including this giveaway! #34 –KELLEY O’B! I’ll be shooting you a message today to get your info to send along to story, and they will send you the book! Enjoy & Here’s to many good beginnings and endings for your projects! The Olympics are coming. I have no idea who any of the athletes are, but I am looking forward to watching some of the sporting events and I hope that some events are shown during the day (not just prime time) so that I can share them with the Lorax as well. She is a gymnastics fan and I think she might get a kick out of it. The Ravellenic Games are also gearing up. I am anticipating being on a few teams and participating in a few events. Here’s what I am thinking will be making the cut as part of my projects this year. I have a set of minis from a swap on Ravelry, under the theme of “Muppets vs Sesame Street”. When I first received my swap package I knew I wanted to work them up all at once as a group. My beekeeper quilt project needs an injection of good mojo and this seems like a good idea. So, 19 minis to be turned into hexiflats for the “Modular Relay”. I was considering challenging myself to knit a sweater for the Lorax (Sundog, which I have the yarn and pattern for and have thought about making for her since it was published). However, the girl does not wear sweaters. Handmade or storebought, it makes no difference. Instead, I am working on a sample for Good Karma Farm (isn’t it pretty? I love this yarn and pattern, Charleston Tea by BabyCocktails) and a new sample for Plymouth, so those would be great to get done for “WIP Wrestling” and “Sweater Triathalon” respectively. That is probably enough, but I am still considering “Charity Rowing” and making some items for PatPatsHats, the “Hat Dash” for my own super-special Rhinebeck Hat, more “WIP Wrestling” for Dan’s socks and my current cowl-in-progress. I am sure I could find a few items for “Frogging Trampoline” and “Cast On Mania Trap Shoot” (start a project, work a third of it, start the next project) just sounds like fun. Dangerous fun. When I attended the Knitter’s Review retreat back in 2010, part of the weekend included a trip to Storey Publishing! 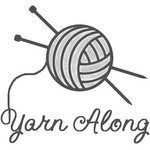 I was so excited to be contacted to participate in the Cast On, Bind Off blog tour! They sent me a copy of this new little resource to review and giveaway, isn’t that nice? So what do I think of this book? My first thought was that it was so small! This book is only 6″ x 7″, just right to have tucked into your project bag or sitting nearby when you start or finish your project. The pictures are fantastic, which for me is HUGE. There is also a spiral binding so the pages will lay flat while you are working (why why why don’t more knitting books come like this?!) I am a self-taught knitter, and left-handed to boot. Good photographs and descriptions help me reverse what I need to do in order to achieve the right results. Each technique has the cast on or bind off name, aliases, and a brief description of the characteristics and when you would want to use it. There are photos of the front and back of the edge. Then you are taken stepwise through working each technique and tips to “Get it Right”. The front cover has an index of the cast ons and the back cover has the index of the bind offs, clever! 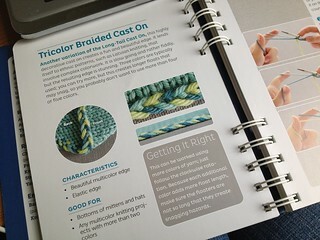 My default cast-on is usually the long tail cast on, but from this book I am now in search of a project that would require something else – I love the look of the “Tricolor Braided Cast On”. I have been meaning to try a color work project, and never thought that the cast on could be multicolored as well! I also find that even after knitting for 10 years, I still need to look up how to Kitchener and I-Cord bind offs. This book will be staying close by my work area especially for those photos and steps. Would you like to receive a copy of this book for your own resource library? Please leave a comment with a way to get in touch (either email or Ravelry id will work). 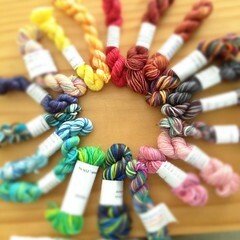 Do you know of a color work project on which I could try this Tricolor Braided Cast On? Is there a cast on or bind off that stumps you? A winner will be drawn next Thursday, July 26! You don’t have to take my word for it, I’m just one stop on this blog tour. Check out what these bloggers and designers have to say about Cast On, Bind Off too! 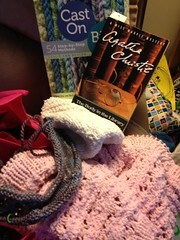 ~ Two of my favorite things are knitting and reading, and the evidence of this often shows up in my photographs. I love seeing what other people are knitting and reading as well. So, what are you knitting or crocheting right now? What are you reading? Take a photo and share it either on your blog or on Flickr. My pile this week is quite the collection. 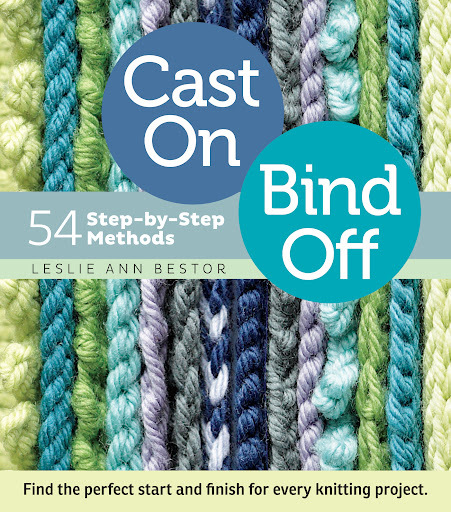 I’ve been reading over Cast On, Bind Off in anticipation of the blog tour that is making a stop here on Thursday, July 19! I will be reviewing the book and I am able to giveaway a copy as well! I have returned to an Agatha Christie Miss Marple mystery, The Body in the Library. When I was in middle school / early high school, 95% of my reading was Agatha Christie. They are so clever, not scary, not gory, not violent. And now, having become a fan of Downton Abbey, I think I can better picture the setting and time period than when I was 13 (and probably was picturing the 1980s). Not shown in the pile there, but on my list to read soon, is a piece by my SIL, Virginia. Her newest piece, the Harper’s Magazine cover story, is about Mary Kay – The Pink Pyramid Scheme. The yarny pile is a mix of in-progress and finished items. 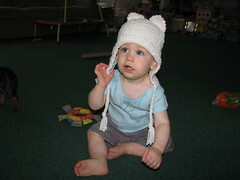 I just finished two samples for Plymouth Yarn Co – Cat Hat with Earflaps & Baby Shrug. They were fun, quick patterns. Each were made in the 6-12 month size. The lil’ nutmeg, being 11 months, obligied to model them for me. I should have tied this under his chin – he kept grabbing it off. Rocking out a pink shrug. Ain’t no thing. 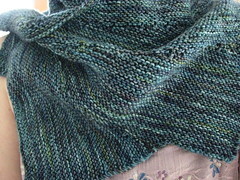 I don’t think I ever showed a picture of my Wings of Hope Wingspan using the Lorelai yarn. I love it and look forward to wearing it often! I really need to find some shawl pins. Also in the pile is a sweater in progress. A sample for Good Karma Farm‘s new DK wool / alpaca yarn. The colorway is Artichoke and the pattern is Charleston Tea by Thea Colman. Nothing but love all around and now that I’ve gotten everything set up and I am ready to knit knit knit. I knit and knit and knit and truly intended to have my Gemini sweater finished to wear to TNNA. I was successful in getting all the knitting done on the Thursday before I left. However, in true gemini form, I could not bring myself to weave in the ends and actually finish this project in time! And sure, it is an excuse, but we were also in a stretch of early heat waves (that have continued) and I was not too keen on the idea of wearing a wool sweater, even if it is short sleeved. I wove in the ends when I returned and finally took a few photos of my new sweater last night. I absolutely love it! Knitting the small size used less than four skeins of Elsebeth Lavold Silky Wool! 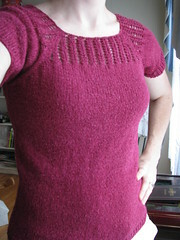 The lace portion at the top was easy and interesting, and the body was smooth sailing. The sweater could probably do with a little light blocking, but I do not think that is neccessary. I’m undecided if I like the lace better on the front or the back, big surprise there. It is falling apart a bit in this photo, but this is pretty much my new favorite way to wear my hair now that the weather is so icky. I have a lion’s mane of thick hair that is wavy and layered. I went hunting and found a sock bun tutorial for my kind of hair and it rocks. With a little bit of help from hairspray, bobby pins, and yes, a sock, even I can pull off this casual up-do. If you know of other styles / tutorials for thick-short-wavy-layered hair, please share! I am really trying to break out of my usual hairstyle rut!